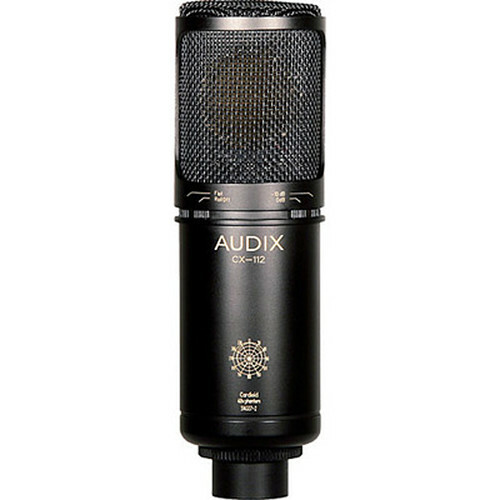 The CX112B Studio Condenser Microphone from Audix is designed to handle vocal and general instrument recordings in both professional and project studio applications. It features a wide frequency response, providing accurate detail and rich audio signal. There is a cardioid polar pattern for minimizing off-axis residual noise while suppressing feedback. A 10 dB pad switch provides additional headroom while capturing highly transient audio signal, and the low-frequency roll off switch further suppresses low frequency hum, rumble, and proximity effect. The CX112B includes an adjustable metal microphone clip and a foam lined wooden carrying case. The cardioid polar pattern effectively minimizes off-axis residual noise while suppressing feedback. A 10 dB pad switch provides additional headroom when capturing loud peaks and transients. A low-frequency roll-off filter eliminates noise and proximity effect. The ultra wide frequency response provides accurate detail and pristine fidelity. Box Dimensions (LxWxH) 9.8 x 5.9 x 3.8"